Our 60" Round Christmas Tree Skirts are 100% cotton and hand-quilted to skirt 6 Feet to 8 Feet high Christmas trees. Tree Skirt has Appliqued and Embroidered Nativity Scene. Made of multicolor plaid cotton fabric with Blue, navy, teal and brown tones and beige plaid fabric in various shades as a background of stars. It has five pointed star and six stars have star within the star. Our 60" Round Christmas Tree Skirts are 100% cotton and hand-quilted to skirt 6 Feet to 8 Feet high Christmas trees. 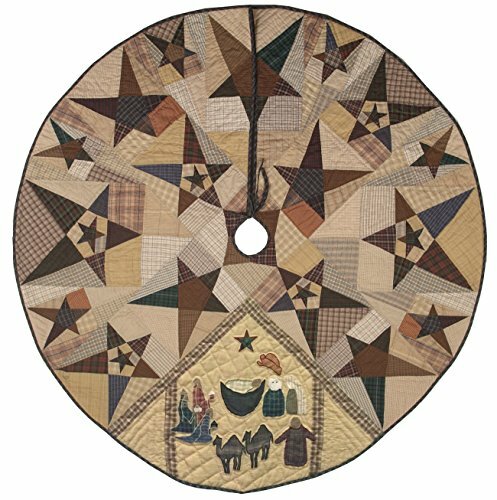 Tree Skirt has multiple Appliqued and Embroidered Angels and Stars . Made of multicolor plaid cotton fabric with Blue, navy, teal and brown tones and beige plaid fabric in various shades as a background of stars. It has five pointed star and six stars have star within the star.